Residents at Oak Bay Lodge get a little holiday boost for the second consecutive year thanks to the Kind Kids Club in Oak Bay. Chloe Cameron started the club a couple years ago. This summer the small group raised $1,163 for wigs for kids. Last year they made cards for all the residents and then made a day of it handing them out. Her little sister even sang a little entertainment on the day they handed out the cards. The project grew this year, to the point where they had to limit the kids creating cards in Windsor Park Pavilion. “It makes me feel really proud of all the kids who want to help. They’re all so kind,” Chloe said. 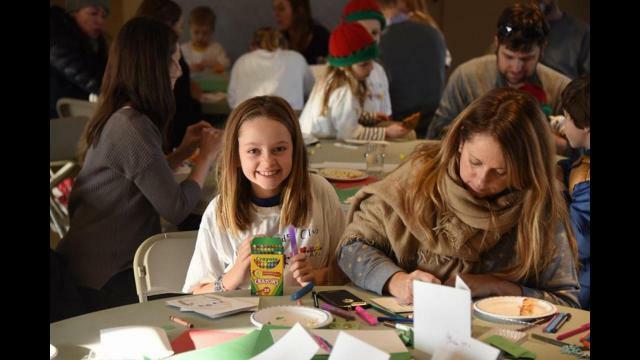 The youngsters crafted cards they’ll hand out to the 234 residents at Oak Bay Lodge, as well as 53 cards commissioned by the district for their annual holiday card mailout. Since the Royal Bank paid for the space, Villages Pizza provided food and Crumsby’s handed out cupcakes, all the funds raised through the cards sold to Oak Bay will be used to purchase Christmas gifts for the pediatric ward at Victoria General Hospital.